A form runs in the context of a user, it could be the current user performing the submit or it could be the result of other actions. This lets you manually set a user. Note that this is only valid for current action list - it does not persist until next list of actions executes, for example, on submit. User Identifier. This could be the user ID, username or email. Can contain form tokens (for example [Email]) and My Tokens. One common scenario is to use [QueryString:UserId] to read the user from the URL via My Tokens. Portal. This could be the portal ID, portalname. 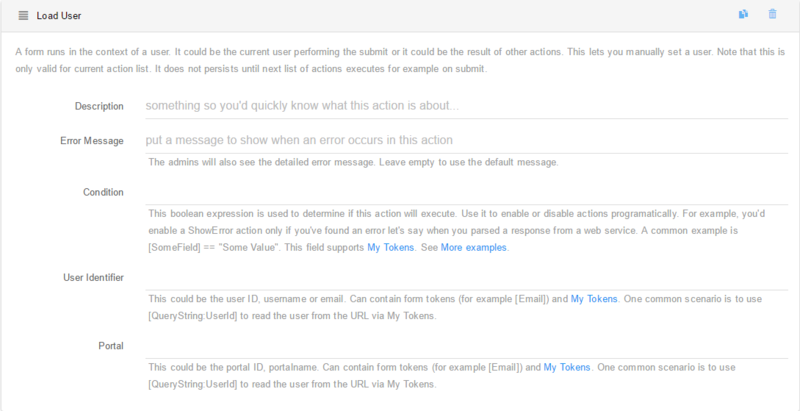 Can contain form tokens (for example [Email]) and My Tokens. One common scenario is to use [QueryString:UserId] to read the user from the URL via My Tokens.